Bradford Teaching Hospitals is calling on people to make a difference to their patients by becoming a chaplaincy volunteer. Volunteers from all religions and none are being sought to help bring a listening ear and a kind word into the lives of hospital patients across the city. The plea has come from the Chaplaincy Service at Bradford Royal Infirmary and St Luke’s Hospital, both part of Bradford Teaching Hospitals NHS Foundation Trust, which is looking to increase its volunteer numbers to cater for people’s spiritual needs during their hospital stay. 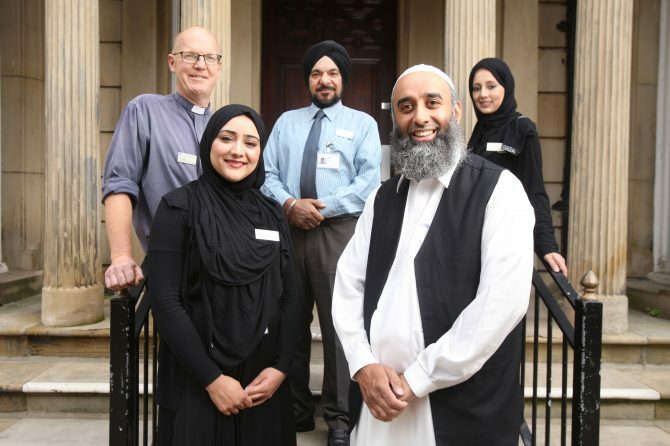 The multi-faith Chaplaincy team consists of seven chaplains representing all major religions in the city, who provide pastoral healthcare for those of religious belief and those of no faith; it is seen as an integral part of the patient experience, contributing to a patient’s holistic wellbeing. Hospital chaplain, Maryam Riaz said: “For many this is a vital source of comfort during their stay. Chaplaincy volunteers help supplement this service by visiting patients and providing a listening ear and words of reassurance. They carry out visits to hospital patients for a few hours every week, to give support and encouragement. To become a volunteer you need to be aged 17 and over, and be able to commit at least two to three hours every week to one of the hospitals. All volunteers must undergo a training course, led by the hospital chaplains, before they are permitted to work on the Trust’s wards. Maryam added: “The chaplains deliver a thorough training programme to equip potential volunteers with the essential skills that are required for visiting patients. Previous chaplaincy volunteers have won awards in recognition for the kindness, commitment and dedication they have shown across the Foundation Trust’s hospitals and its patients. The Foundation Trust will be running a four-day induction course for chaplaincy volunteers from 30th September – 3rd October 2019, 9.30am-3.30pm, at St Luke’s Hospital. Anyone interested should apply now, so the various checks can take place ahead of training. Bradford Teaching Hospitals NHS Foundation Trust is responsible for providing hospital services for the people of Bradford and communities across Yorkshire. We serve a core population of around 500,000 and provide specialist services for 1.1 million people. Our 5,500 staff work over several sites, including Bradford Royal Infirmary, which provides the majority of inpatient services, and St Luke’s Hospital, which predominantly provides outpatient and rehabilitation services. We also manage local community hospitals at Westwood Park, Westbourne Green, and Eccleshill. In early 2017, a new £28 million wing opened at Bradford Royal Infirmary, part of a £75m investment to improve patient care across our hospitals over a five-year period. It provides world-class facilities for elderly care, children’s services, a state-of-the-art intensive care unit with increased single-room provision and a retail concourse. The new wing is a continuation of our work to improve patient experience after our new £2 million neonatal unit officially opened in January 2015. Our maternity services were recently shortlisted for the Royal College of Midwives’ (RCM) Midwifery Service of the Year Award, recognising excellence and innovation in the provision of maternity care. In 2017, we also completed a £2m refurbishment of our Emergency Department (ED) as part of an ambitious vision to create a more efficient acute medicine service for the people of Bradford. It has been designed to provide a slicker and more efficient service, with faster senior clinical involvement at an early stage in the patient pathway. As a teaching hospital, we are at the forefront of education and development in healthcare, and have an excellent reputation for research performance. We are one of the leading centres in conducting applied research in the country, particularly in quality and safety, elderly care and rehabilitation. The Trust is home to the Bradford Institute for Health Research (BIHR) where researchers have led the development, validation and implementation of the award-winning Bradford Electronic Frailty Index (eFI) which helps calculate an elderly person’s risk of disability, impairment, falls and complications of chronic diseases, as well as their diminishing independence and capability. This is now being used by 98% of all GPs across the country. Our award-winning Ophthalmology department is home to numerous worldwide clinical trials taking the lead in eye care research and we are one of only three sites in the United Kingdom to be enlisted in the Perioperative Enhanced Recovery Hip Fracture Care of Patients with Dementia (PERFECTED) study, which will investigate how the NHS can introduce better standards of care to improve outcomes for people with dementia.